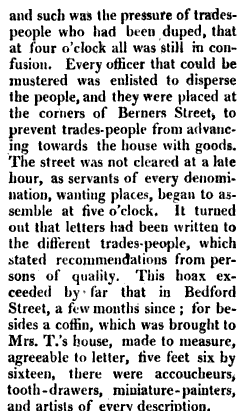 Today is the anniversary of the Berners Street hoax, perpetrated by Theodore Hook in London in 1809. 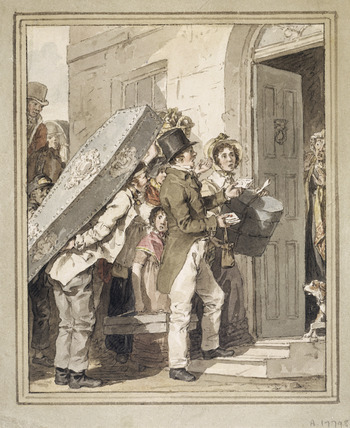 Hook had made a bet with his friend, Samuel Beazley, that he could transform any house in London into the most talked-about address in a week, which he achieved by sending out thousands of letters in the name of Mrs Tottenham, who was supposedly the resident at 54 Berners Street, requesting deliveries, visitors, and assistance. There was a widow living there but her name was not Tottenham. 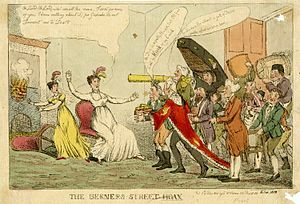 Every Officer that could be mustered was enlisted to disperse the people, and they were placed at the corners of Berners Street to prevent trades people from advancing towards the house with goods. 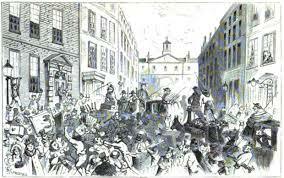 The street was not cleared at a late hour, as servants of every denomination wanting places began to assemble at five o’clock. It turned out that letters had been written to the different trades people, which stated recommendations from persons of quality. A reward has been offered for the apprehension of the author of the criminal hoax. Hook rented a room in the house directly opposite 54 Berners Street, where he and Beazley spent the day watching the chaos unfold. Despite fervent efforts to find the perpetrator, Hook managed to evade detection, although many of those who knew him suspected him of being responsible. It was reported that he felt it prudent to be “laid up for a week or two” before embarking on a tour of the country, supposedly to convalesce. 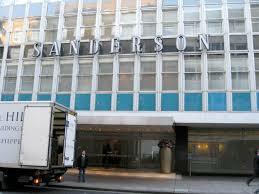 The site at 54 Berners Street is now occupied by the Sanderson Hotel. A hoax recipe would do well today, but I have given quite a few already: for example, here — http://www.bookofdaystales.com/p-t-barnum/ Hoax dishes involve making a dish that looks like one thing, but is, in fact another entirely. Bob Blumer is a modern master at hoax recipes. 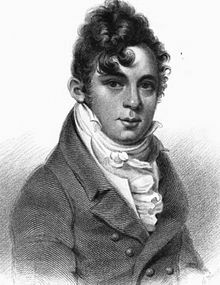 You can check out his cauliflower popcorn or salmon cupcakes here: http://www.bobblumer.com/recipes/ I am going to go with a peculiar Georgian recipe, deep-fried strawberries from Cookery reformed; or, The Lady’s assistant, (1755). I have edited the recipe slightly, but you get the idea. 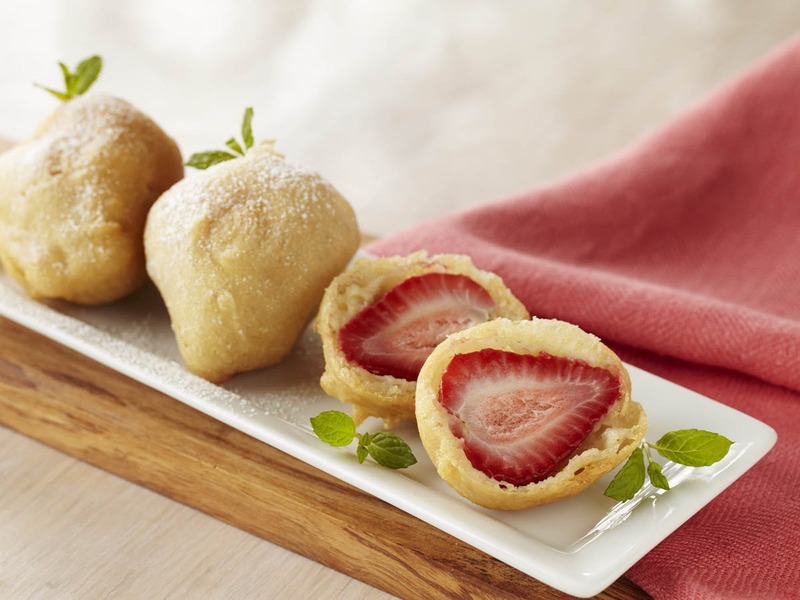 Move over deep fried Mars bars. Make a batter with flour, a spoonful of sweet oil, another of white wine, a little rasped lemon-peel, and the whites of two or three eggs, make it soft, so as to drop with a spoon. Mix it with some large strawberries, and drop them with a spoon into hot oil. When they are of a good color, take them out, and drain them on a sieve. When they are done, strew some sugar over them, and glaze them.